I just listened to the 3 April podcast “360 with Kurt Anderson”. In that episode he interviews a man called “Mr. Jalopy” who makes the point that we have forgotten how to repair things. It used to be (not that long ago) that every home had a work bench, even if crude, and people knew how to repair things, things like a frayed lamp wire for instance. Today we throw that lamp away. Truly a sad state of affairs. Your post of the Repair Manifesto is very important in today’s world. Can we make the change? Perhaps the economic downturn will help. I’m a fan of Swiss Miss. I’m an American living just north of Basel in Germany. This reminds me of my grand-mother, who would never throw away anything and would always try and repair everything. I think it’s a good thing! I ca swear by these words! I am a huge advocate for reusing, restoring and repairing. I am going to link this post on my blog and spread these wise words! 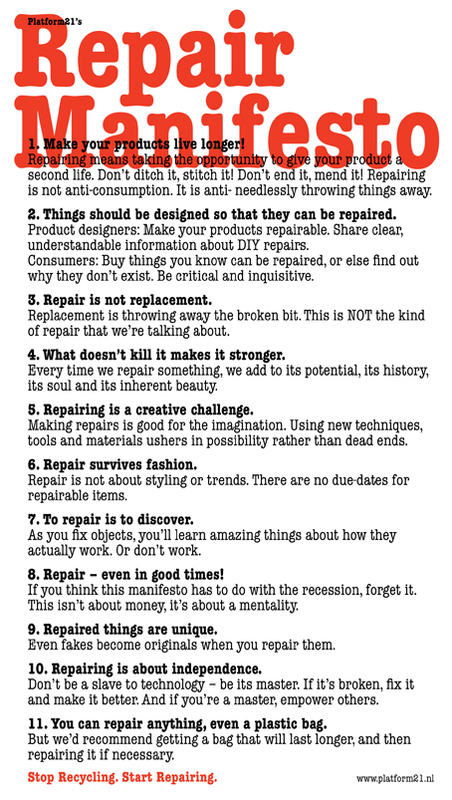 The repair manifesto is indeed inspiring and gives reason for hope. The new world has been quick to give up the old and wise practise of repairing and reusing. In India, where I live, we are still lucky to have people who can repair just about everything. Perhaps, it can also help prevent global warming, by reducing dumping of gadgets, thus reducing the extra production, resulting in lesser carbon emissions in manufacturing and transport of goods. I believe in this manifesto and I always thought there is something wrong by recycling. I don’t mean it should not be done. It should be done somthing before it. because Recycling takes a lot of energy start from gathering, building the factory and recycling. I really enjoyed your article. For me nothing is much more exciting then taking something broken, dig around in it, putting it back together and seeing that it works again. This reminds me of my dad, a wonderful man with an amazing sense of humour. He used to have an old axe, that surprisingly never grew old and worn out. If I should ask him about it his reply would always be that he had to replace the blade only three times, and the handle only about 5 times and so the axe always stayed brand new. thank you swissmiss and Free People! Sent this along to Apartment Therapy, did tell them where it came from. I like to follow point 2 and only buy stuff that’s repairable, but repairable products are unbelievably limited in Western society. However, go to Africa (especially Zimbabwe) and there are people who will repair anything!